A virtual office in D.C. provides all your basic business needs at a fraction of the cost. D.C. is without a doubt an expensive city. If you have a business of your own and/or work from home, a virtual office in D.C. care of your basic business needs without you having to worry about the costs of renting traditional space in the city. You receive a mailing address, phone handling, administrative support and fully furnished office space or conference rooms equipped with the latest technology. A virtual office in D.C. decreases your daily commute. D.C. is known for its rush hour with heavy traffic, and being able to reduce or do away with a commute would not only save time but also reduce your carbon footprint. A virtual office in D.C. allows you to come in only when needed. Furthermore, when you do come in, AdvantEdge offers all the conveniences of its centrally-located centers which all have underground parking garages or are within walking distance to the Metro. A virtual office in D.C. is perfect for satellite offices. 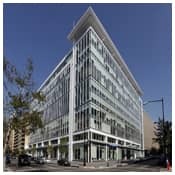 If you live elsewhere but find yourself coming to the captial quite often for business, a virtual office in D.C. is the perfect satellite office solution. When you come into town and need a space to meet with people, conference rooms are already set up and ready for use. In addition if you only need a touchdown space to work in for a few days, day offices and work stations are available as well (not to mention mail forwarding and other administrative services!). Virtual offices anywhere can be the solution to your business needs, but in a city like Washington D.C., they can be especially beneficial and convenient. Please feel free to contact us today in order to inquire about our virtual office packages!